The all-encompassing British football manager is perhaps the most revered piece of dogma in this island’s footballing belief system. Arguably no one has typified this ceremonial role of idol, patriarch and high priest as much as Brian Clough, who continues to influence popular tastes on the sort of perfect, omnipotent higher-being fans should desire to run their football club to this day. It is this cult of the archetype head coach that led the English media to first be seduced and later fall in love with Jose Mourinho: their messianic, romantic saviour. But back to Brian Clough. “Old big head”, he was called: the most arrogant, quotable and brilliant manager of his age, and Clough’s achievements remain legendary. Transforming Derby County and Nottingham Forest from being provincial sides languishing in the backwaters of the second tier into first division champions and European contenders, his crowning glory was guiding Forest to back-to-back European Cups in 1979 and 1980. His successes often came through direct confrontations with chairmen along with a beer-soaked, common sense approach to training, team building and a deliberately downplaying of tactics or technical details. To the English mind-set, enthralled with its ludicrous ideals of enterprising individualism, nostalgic conservatism and an insatiable hunger to reinforce its precarious sense of self-control and self-esteem, Clough was a safe, respectable rogue like such national icons as Sir Francis Drake and his ilk. He was like a Kipling poem that had somehow morphed into life as a bullish pub landlord, refusing to tolerate nonsense while governing his bar like a showman; he was a self-indulgence for the believers in eccentric, British genius while acting as a comfort to those suspicious of intellectualism and unorthodoxy. It is this teetering, illogical pedestal upon which the image of the British manager has been hewn over the decades. And while others have been more successful, Clough is the man who breathed life into the soul of the sculpture: an effervescent abstract measure against which various commentators have found his successors, including Alex Ferguson, to be wanting. Successful without winning too much and offending anyone’s sense of proportionality or fair play; brash without threatening moral virtues; and witty enough to make his intelligence acceptable: Brian Clough was the polite, mainstream paradox that reinforced the status quo with his challenges against it. While Mourinho may have ascended to the self-proclaimed realm of being “a special one” through winning first the UEFA Cup and then Champions League with an unheralded Porto side in consecutive seasons in 2003 and 2004 respectively, his achievements don’t match up to Clough’s exactly. They did enough to secure him a job at Chelsea, where he would come painfully close to dominating English football. Though not similar or comparable to his spiritual predecessor, no coach has come as close to defeating Sir Alex Ferguson at his own, legacy building game. Unfortunately for Chelsea, Jose was interrupted – as he so often is – by the in-house politics and ego of the club’s owner, Roman Abramovich. This inability to live easily with his all-powerful superiors, forever wanting more control over his team and his situation, is a parallel shared between both managers. As well, the Portuguese’s vivid presence and charisma are more than adequate to shoulder any comparisons when placed in front of a camera, microphone or dug-out. It is as if in order to win everything, they must command everything – from the finest details to the broader struggles of the boardroom and the balance sheet. Ferguson and Wenger have both gained power over their own chiefdoms not only thanks to years of service and success, but from a persistant demand for such authority and responsibilities from the very beginning. Clough and Mourinho were wrenched from their adopted homes before they could convert their pet projects into unassailable powerbases at Derby County and Chelsea respectively. Since leaving London, Mourinho may well have achieved many further triumphs but there’s always been a sense that his wins at Inter Milan and Real Madrid were achieved to meet a brief. He managed in Italy and Spain like a mercenary, hired to deliver specific objectives; winning the Champions League at Internazionale and sabotaging Pep Guardiola’s march into history with Barcelona. While it is tempting to speak of Mourinho like some sort of draining Cleopatra or Casanova figure, that exhausts their lovers with explosive yet unsustainable lust, the long-term damage he leaves at a club is overstated. He wasn’t charged with leaving a legacy at Real or Inter and so didn’t seek to create one, not in to the same standard as the one he left in West London anyway. Rather than work to a specification, at Chelsea he built with fervent passion. Though he showed heart in his relationship with his players in Italy, he didn’t love Serie A like he does the Premier League. England is his spiritual footballing home and the team he assembled at Stamford Bridge between 2004 and 2007 has arguably managed and motivated themselves ever since, always using his foundations as their base; their reference point. Every successful Chelsea manager since Mourinho has fallen back on the solid groundwork and personalities he established while almost all those who opposed or sought to replace his infrastructure have failed miserably. Rafa Benitez stands alone as the one manager able to lead Chelsea out of this hinterland to silverware in his brief interim stint, but even then figures such as Frank Lampard, Ashley Cole, John Terry and Petr Cech were pillars who upheld the limited progress of the Spaniard. Perhaps the potency of this bedrock comes through its shameless functional substance. Throughout his career Mourinho has been the arch pragmatist. Even at Real Madrid, in charge of the most expensive squad of all time, packed with world-class attackers, he provided flair in line with the job’s requirements rather than a personal desire to play the role of entertainer. Mourinho would rather make history and win hearts and mind through honours, and since few fans begrudge winning trophies, it’s an approach that usually works. Some say Brian Clough was the greatest manager England never had, and as Jose returns to his blue throne at Chelsea, a section of Manchester United fans may well be having similar thoughts over the stewardship of their club. For those who eye his Stamford Bridge homecoming with jealousy as David Moyes takes over at Old Trafford there must also be a nagging fear about the potential for Mourinho to utterly dismantle their club’s domestic, supremacy in a manner his earlier stint in the Premier League suggested. United fans must also hope that the reinstated Chelsea boss hasn’t taken his snubbing by the out-going Ferguson to heart. The source of Mourinho’s desire to destroy Barcelona came from a jilted job application as much as their long term teasing of him as “The Interpretor”. 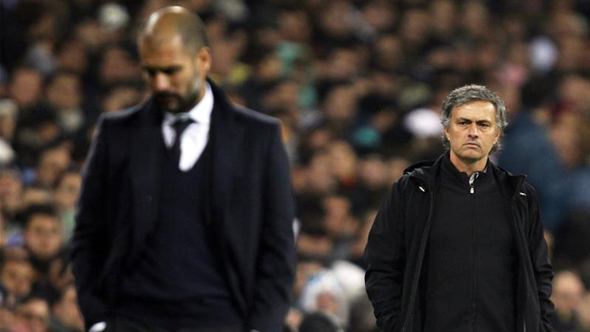 When Barca plumped for Pep in 2008 they also created their nemesis by rejecting the Special One. Now, denied the job he so publicly canvassed in replacing Sir Alex Ferguson – an opportunity for which he practically performed a degradingly meek audition to the crowds and press after having eliminated Manchester United in the Champions League in March – he may seek to knock another bitter, unrequited love off their proverbial perch. Rumours are that Mourinho was considered too controversial and egotistical for Bobby Charlton and the Manchester United board; a similar decision to the ones made by the FA when deciding against appointing Clough in 1977 and 1982. With Ferguson no longer around to see off the most visceral challenges to his legacy, he must be hoping that his chosen champion, David Moyes can repay the faith shown in him. United’s new boss will need to quickly develop a fresh, defining era of heroes to buttress the club’s historical status in order to prevent Mourinho’s next power team from finishing what he started. Like Clough he is a figure whose common sense thinking and forthright personality can be claimed by two sides of the same argument, each to fit their own purposes whether the conflict lies in tactics, team-building, media handling or any other facet of the game. Although he may have longed for a shot at succeeding Sir Alex Ferguson at United, Mourinho at Chelsea somehow feels right and proper – perhaps because his first cycle lacked the closure and peak it deserved. It will certainly be an interesting season in the Premier League, yet with Moyes taking over at Manchester United in the name of continuity, City seeking sophisticated, long-term empire building through the technocratic Manuel Pellegrini, and Arsene Wenger appearing to finally be ready to cash-in on the financial advantage the Emirates was designed to provide, it may be that Mourinho’s appointment signals a terrifying proposition for Chelsea’s league rivals. Roman Abramovich may have just accepted that he made a mistake, and an unnerving period of trust and stability may be about to take hold at Stamford Bridge. Like Sir Alex Ferguson, Mourinho is an expert at marshalling his resources, meaning a lucrative stadium move to a larger premise may now also be feasible for the London club. Over the next few decades, Roman Abramovich may well become the sovereign ruler of the kingdom Mou built. This entry was posted in Analysis and opinion and tagged brian clough, chelsea, English Premier League, jose mourinho, manchester united, nottingham forest, pep guardiola, roman abramovich, sir alex ferguson by Greg Johnson. Bookmark the permalink. As a Forest and Brian Clough fan I must say I really enjoyed this well written Article. If it doesn’t work out for Mourinho at Chelsea then he could always follow in the great mans footsteps and come and conquer Europe from the City Ground. He’d be more than welcome! That’s really kind of you to say Ian, thanks! Mourinho to Forest… never say never. Seen stranger moves happen on Football Manager. Another Forest fan sending compliments and thanks for a thoughtful and well informed piece. I wanted to know more about the so called tactical limitations of clough. we all know he was THE greatest man manager and motivator ever in the game. In his last season with forest, club captain stuart pearce used to have another team talk after clough’s talking the tactics of the other team, and what tactics forest would use against them. recognising that clough’s dont worry bout them, they should be more worried bout us was great for motivation, it sadly wasnt enough by that stage in football. Was it not just “english tactics” which at that time was based on 4-4-2 with wingers and trying to use the wingers to get beyond the defence and cross for a striker or inrushing midfielder to score. All this applied to a hard working defence and strong goalkeeper. Is this not what fergie used for years too??? ?